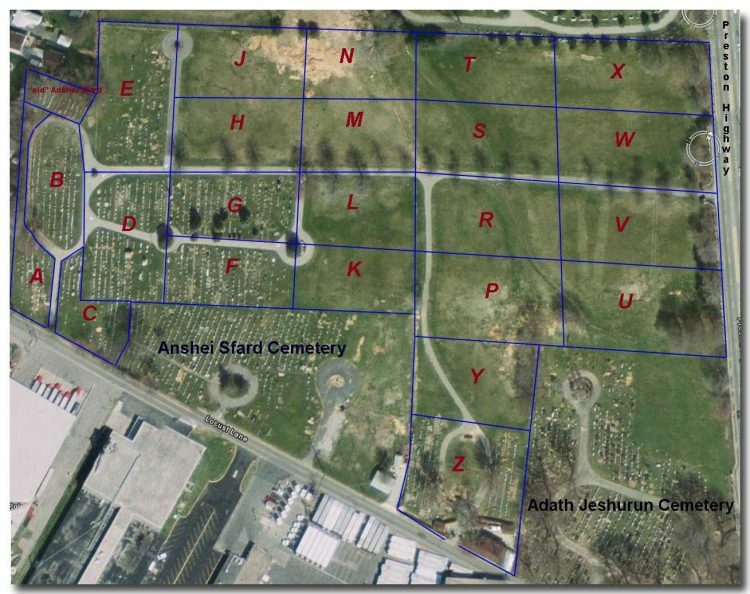 Keneseth Israel Cemetery – Herman Meyer and Son, Inc.
A list of people buried in each section and their grave location is below the cemetery map. If the person’s name is underlined, you can click the name and you may view a photo of their headstone. If you need further assistance with this cemetery, please contact Herman Meyer & Son, Inc. and we will assist you. Please understand that we are working to add more headstone photos! SYLVIA F. F 86 b. ROSE GARON D 368 b.
LILLIAN N. D 73 b.
SELMA S. D 76 b.
JOSEPH H. F 326 b.
REBECCA H. B 375 b.
CAROL ANN B 369 b.
d. 10/21/2017 Cincinnati, OH f.
was added) B 372 b.
RUTH B. B 305 b.
LENA S. D 27 b.
MAX I. C 296 b.
SABINA B. D 428 b.
RACHAEL C. C 231 b. A. JACOB B 314 b.
ANNA S. B 313 b.
D. C A M b.
EMMA G. D 457 b.
HANNAH B. D 457 b.
DAVID R. D 127 b.
JACOB C B H b.
SARAH H. D 124 b.
YETTA D. D 126 b.
TILLIE W. F 270 b.
ESTER M. B 136 b.
SALLY K. B 165 b.
ALEX D. E 319 b.
BESSIE H. D 420 b.
Jr., DAVID G 433 b.
HARRY H. F 133 b.
LOUIS L. D 421 b.
MAX J. D 50 b. A. GARY G 119 b.
ISADORE E. G 148 b.
LIBBY G. G 122 b.
MAX, P.F.C. G 121 b.
PHILLIP L. G 95 b.
SARAH B. B 250 b.
BESSIE P. G 158 b.
DAVID N. A 207 b.
DORA SARAH D 210 b.
F. ??? D 94 b.
HARRIS J. D 209 b.
JEANETTE G. E 434 b.
KATIE O. D 43 b. MAY A. D 89 b.
SELMA L. E 312 b.
WILLIAM E. D 89-A b.
ANNA C. D 327 b.
REBECCA R. F 10 b.
FAYE MOLLY B 258 b.
LILLIE S. B 202 b.
EVA T. B 96 b.
JULIA O. D 437 b.
KATIE W. D 321 b.
HAROLD S. B 55 b.